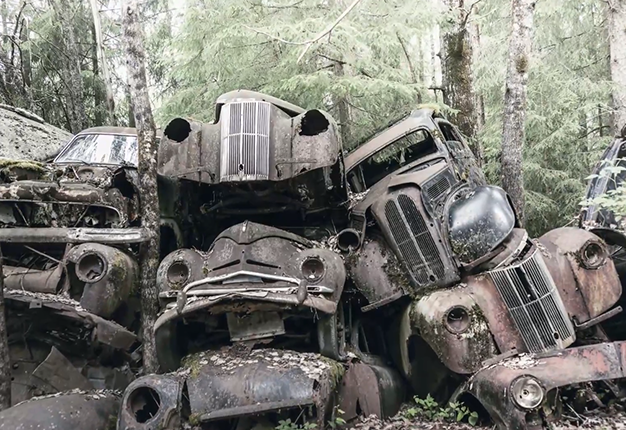 In Sweden you'll find a strange graveyard of cars, many left behind from American GIs in World War II. The forest in Bastnas paints somewhat of a grim picture with a plethora of Saabs, Volvos and Fords from the 50's and 60's covered in vegetation. Some have trees that have taken root and sprouted through them. Once upon a time these cars roamed the streets in all their glory and if they could talk, they would have plenty of stories to tell. Now, they lie abandoned in a creepy site. According to Atlas Obscura, the auto graveyard is said to be owned by a pair of reclusive brothers who live on the land. The sight of all the abandoned cars draws tourists from all over the world. The owners have posed an eerie warning for those who which to make off with a classic chassis: "If you get hurt or die, remember in this place, no one can hear you scream."